Produktinformationen "Shapers Fins Carbon Flare AP02"
The Carbon-Flare® Series is a performance driven construction, ultra light-weight and strong. The carbon insert at the bottom of the fin creates a solid base that reduces flex, this provides additional drive and acceleration. The stiff bases allows the top half of the fin to flex in a manner that bursts energy out of transitions, due to the recoil rate of the carbon and Core-Lite® Foam. The AP02 is Asher Pacey Signature Model. The AP02 is a Medium-Large template which is designed for Medium to larger surfers. The template is design with a rake ratio that allows the AP Series to surf from tight pocket surfing to open face carving. 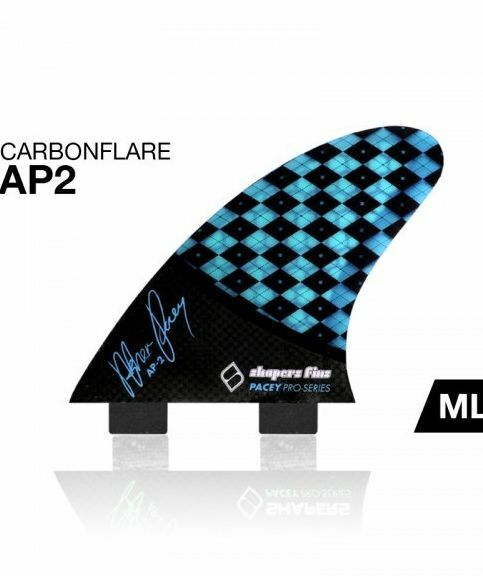 The AP Series uses Shapers Carbon Flare Technology that creates a stiff base and allow the fin to flex in a way that releases energy between transitions that provides maximum acceleration and drive. A great choice for most surfers, boards and conditions in the medium to large fin range. Weiterführende Links zu "Shapers Fins Carbon Flare AP02"
Kundenbewertungen für "Shapers Fins Carbon Flare AP02"